"The Marché Chromatica paintings are about market scenes. They have never been sketched on site, purely from my imagination. 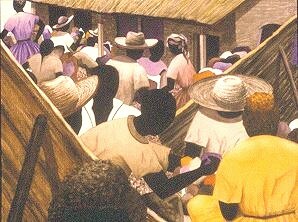 I like the feeling of the market places very much, 'Caribbean malls.' Busy, busy, busy. Everyone exchanging goods, ideas, money, gossip, news, etc. The "Chromatica" relates to the fact that each of my market scenes intertwines three colors. Two of the colors which are common to all the paintings are sepia and purple (mainly receding). Then I add what I call the theme or mood color: either blue, orange, red, or green. The brown/orange of #27 feels most like Anguilla, of course... hot, energetic days at the market."